The news swept through my office, triggering a barrage of scandalised questions. One colleague was so outraged she nearly walked into a wall on her way out, stopping innocent colleagues to inform them I was going to Grangemouth. Her face was a picture of astonishment and outrage but she’s a thespian that one, nothing ever knowingly under-performed. Her range of expressions would have mesmerised the audiences of the silent movie age. To be fair to my colleagues it was a bitterly cold dark Friday evening when most people are on their way to family, pub or home. Yet I was heading for what is many the local industrial heap. They’ve grown-up in the shadow of this colossal industrial behemoth, squatting and smoking on the banks of the Firth of Forth, dominating the surrounding countryside. On the crags near my office you can see the tiny smoke plumes and chimneys some fifteen miles away on the distant horizon. Grangemouth draws the eye from central belt motorways, from the lowland hills of east Scotland and from across the waters of the Forth. She’s an elusive glimpse through the Glasgow-Edinburgh train window and a fearsome smoke-spewing monster crouching over the town and fields with grazing horses. Blade Runner – note the similarity between this world and the smoking chimneys, flares and lights of Grangemouth. There’s a side to Britain that is ugly and polluting; most of us rush past the unloved infrastructure that keeps the lights on and our homes warm. Yet there can be a strange beauty about places like Grangemouth, or the industry along the Severn, or the weird landscape of the Dungeness power station. The local communities depend on this industry for jobs and a raison d’etre. They have to endure pollution, a blighted landscape, neglect, industrial disputes with the odds stacked against them and living in a blast zone. 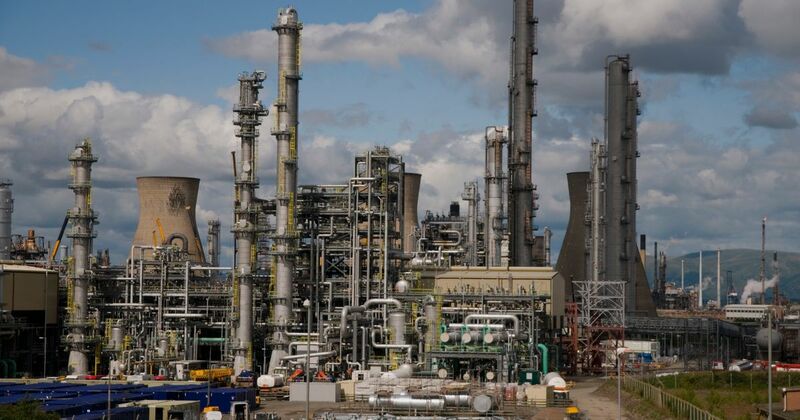 Grangemouth Refinery employs about 1,200 permanent staff and a further 1,000 contractors. The town of Grangemouth, blighted by disastrous post-war planning, used to be a busy port but now its primary focus is the refinery. 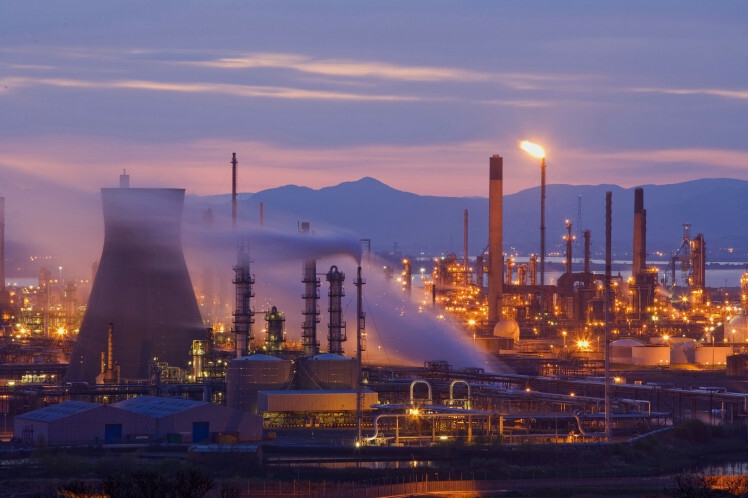 Grangemouth Refinery is surely one of the pin-ups of British industry. One of the largest of its kind in Europe, it’s 700 hectares sprawl with cooling towers, tall chimneys, storage facilities and an insanely tangled mass of sleek steel pipes. It’s an artificial landscape that is a compelling hymn to smoke and concrete, curve and line, steel and space. So here I am on this freezing cold night, walking through the refinery where glittering industry meets a Blade Runner set. It looks like a giant has been wandering round drooping fairy lights around a forest of chimneys and pipes. Blade Runner is not a coincidental reference – the film’s director, Ridley Scott, grew-up in the similar industrial landscapes of Middlesborough. There’s hardly a soul about. I walk through a symphony of hypnotic noise. Oil tankers crash through gears, liquids gurgle in pipes, valves click, flaring chimneys hiss and roar, flames pulse, generators hum and growl. Clouds of steam fold and drift silently, endlessly, through the night air, a mesmerising sight. A building with three belching chimneys stirs and strains like a ship at its moorings. This living, breathing entity is straining and probing at the safety systems that control it, harnessing and channelling powerful forces. If Grangemouth ever decided to put on a show, half of Scotland would know about it. I wait at the kind of bus stop whose timetable promises a bus but whose air of abandoned surliness suggests I would be foolish to believe it. Surprisingly, and with a certain of relief as the cold seeps into my bones, the bus arrives. Raw industrial beauty it may be but Grangemouth is also an anachronism. This ageing power station is an affront to the green, carbon-free future, its days should be numbered. Quite where that leaves the town clustered round its edges is a difficult question. In the meantime the fairy lights will glitter, the clouds will billow and that strange industrial symphony will continue to play. Please note – I don’t own the copyright to these photos and don’t know who does! Please contact me if these photos should not be used. “Her face was a picture of astonishment and outrage but she’s a thespian that one, nothing ever knowingly under-performed. Her range of expressions would have mesmerised the audiences of the silent movie age.” –Hilarious. What would we do without the histrionic? Another fascinating wander. Industrial plants have a dystopian beauty about them. They seem alive and immortal. If we vanished, they’d survive just fine, churning and billowing into eternity. I could sense the anxiety about the bus. I’ve been in such situations, waiting at lonely bus stops far out in the countryside. Always such a relief when they show up. I’ve got Stanlow half and hour from me to get my industrial fix. Oil refineries are places where the truth outs: reminders of our continued dependence on fossil fuels and also in their utterly stark utilitarian design. Thanks for sharing Alex and next time, take your camera! Great stuff, Alex. 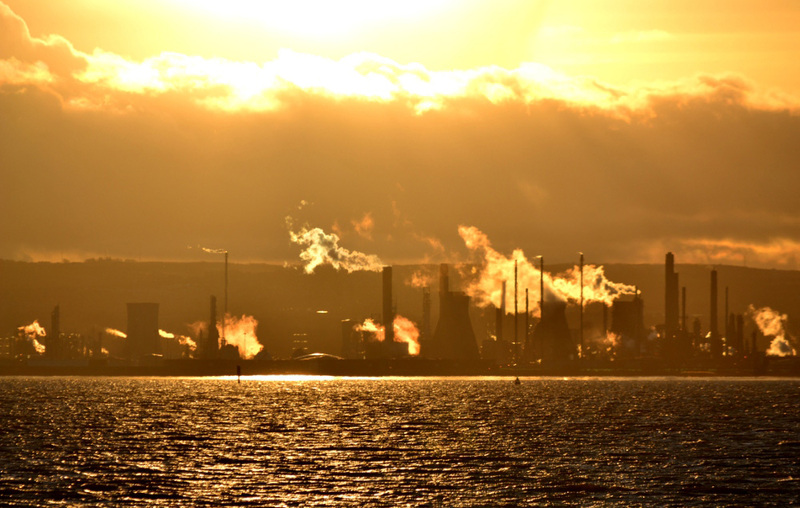 I drove past Grangemouth a couple of days ago on my way down south from the Western Isles. Compared to the stark, lonely landscapes of the Outer Hebrides and the Scottish Highlands, the sight of the chimneys and piping came as quite a shock even though I was expecting it. Nevertheless, it did have some sort of jarring raw beauty – the anthropocene written in steel and smoke. That would have been quite the contrast. Mind you, the Western Isles isn’t completely free of the anthropocenic impact with that missle base on Uist. Hope you had a good time there. As we’ve discussed before, not my favourite part of Scotland but compelling all the same.